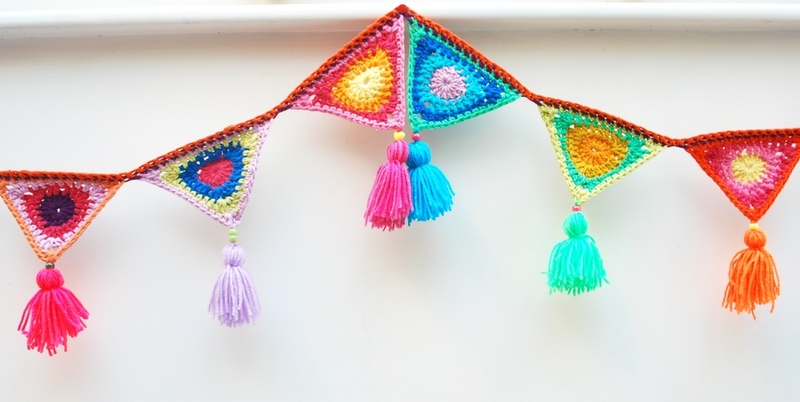 Bring a bit of summer sunshine into your life with this gloriously colourful crochet bunting....the antidote to those grey winter skies! If I had a pound for every time I was asked for this pattern whilst in my hut at the Bath Christmas Market (2015) I would be posting this crochet tutorial from Barbados! As it is I am snugged up in front of the wood burner happy to be fulfilling my promise to post this pattern first thing in 2016! A big thank you by the way to everyone who came to see me in my hut...it was amazing to see so many lovely faces and I hope to do it all again! The secret to successful bunting is to use a good quality sturdy cotton. Cotton yarn gives the bunting a solid weight and shape with no sagging. My preferred yarn is Rico's creative Cotton aran that comes in a range of 37 shades giving you an incredible choice of colours to play with. The affordability of this yarn makes it perfect for a project like this as it really depends upon lots of glorious colour! I have put together a pack of 12 of my favourite colours to get you started and is available from my shop here. To make this pattern you are going to need at least 4 different colours of yarn but please don't worry if you don't have any cotton as this crochet bunting is the perfect choice for using up all those bits of scrap yarn that we have stashed away. Try mixing it all up and playing with different weight yarn too. I've had some great results when I've not been too rigid about following the correct rules of a pattern. If you would like to make the bunting as I have then you can buy your cotton pack from me here. For this tutorial (UK crochet terms) I am using Rico Creative Cotton Candy Pink, Light Pistachio, Tangerine and Fuchsia together with a 4mm hook. Chain 6 and join with a slip stitch into the first chain (as shown) to make a loop. Chain 3. This counts as your first treble crochet. Work 14 treble crochet into the centre loop. You now have 15 stitches. Using a slip stitch, join your work into the third chain as shown. Cast off this colour. Join your new colour (pistachio) and chain 3 (this counts as your first treble crochet. Work 1 treble crochet into the same stitch and then work 1 treble crochet into the next 4 stitches. Work your first corner as follows: 2 treble crochet, chain 2 and 2 more treble crochet all into the same stitch. Work 1 treble crochet into each of the next 4 stitches. Into next stitch work 2 treble crochet and chain 2. Using a slip stitch join into 3rd chain and cast off this colour. Join your 3rd colour (tangerine) and work a chain 3. This counts as your first treble crochet. Into the next stitch work 1 treble crochet. Into next stitch work 1 half treble, into next 3 stitches work 1 double crochet into each stitch, into next stitch work 1 half treble and into next stitch work 1 treble crochet. Into next stitch work a corner as follows: 2 treble crochet, chain 2 and 2 treble crochet all into same stitch. Into next stitch work 2 treble crochet, chain 2 and join into 3rd chain with a slip stitch. Cast off. Into same hole work 1 half treble crochet. Work 2 more half trebles into same stitch. This completes your first corner. Complete the 3rd and final corner by working 2 half trebles, chain 2 and joining this with a slip stitch to 2nd chain. Cast off and sew in your tail end. Now all you need to do is repeat repeat repeat until you have a neat pile of triangles. Using any colour chain 5. Taking your first triangle and starting in a ch 2 corner space work 1 double crochet, continue with 1 dc into each stitch along one side starting and ending with the chain 2 corner space. ch 2 ( creates a neat space between the next triangle) and repeat with your second triangle. continue until you have a string of bunting triangles to suit the length you require. Finish with a ch 5 after the last triangle. Cast off and display your bunting! Now all that is left is to add the all important tassels!